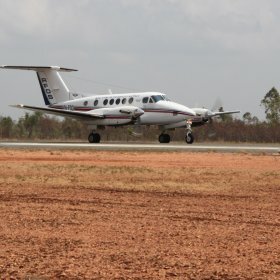 Rehbein Airport Consulting prepared detailed engineering design documentation for major pavement maintenance and aerodrome ground lighting upgrade works at a Weipa Airport in far north Queensland. The scope included a full visual inspection of existing movement area pavements, provision of a brief for geotechnical investigation of the runway, pavement strength assessment and recommendations for rehabilitation works. Required pavement extension works to the apron and stub taxiway to address existing non-compliances with Civil Aviation Safety Regulations were also defined. Together with a full replacement of the aerodrome ground lighting system and refurbishment of the perimeter fence, these works were initially defined through an Order-of-Magnitude Study to a level sufficient to allow estimates of capital cost to be developed to establish a budget for the works. Subsequently, detailed design documentation for the defined maintenance works, together with a proposed extension of the RPT apron to accommodate an additional Q400 aircraft parking position, was prepared and provided to the client for tendering of the construction contract. We provided assistance throughout the tender evaluation and post-tender negotiation stage to assist the client in awarding a contract to enable the works to be completed before the commencement of the 2011-12 wet season. During this process we investigated options for the redesign of the pavement structure to permit the use of local materials. We are currently providing technical assistance to the client’s site supervisory team during the construction of the works.